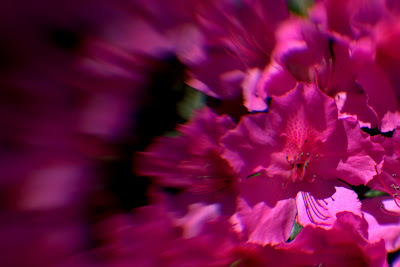 This week is Norfolk's 56th International Azalea Festival. The azalea's this year are just magnificent. A cooler than normal spring has produced the best blooms we've seen in years. This shot is one of the large bushes in my backyard. Canon 40D, 1/800 sec at f/4.0, ISO 200 with the Lensbaby Composer.